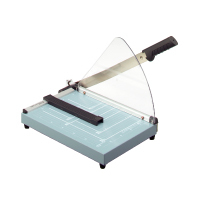 Self-sharpening steel blade cuts everything from single tissues to mat board. Edge ruled in centimeter. Reference marks for quick paper positioning. 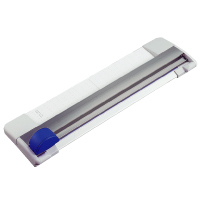 Feature sliding paper guide, patented automatic paper clamp plus plastic safety cover. 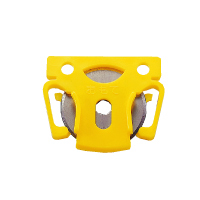 Steel blade can be locked and positioned when not in use to prevent accident falling. Non-skid rubber base. 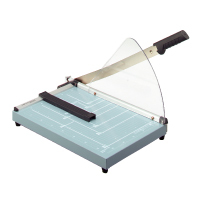 Exceptionally safe and easy-to-use cutter. 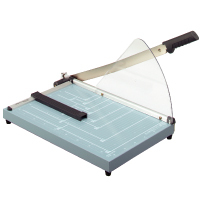 Self-sharping cartridge type rotary blade enclosed in rugged blue plastic housing won't expose the cutting edge when the guide bar is lifted or even changing the blade itself. Compact, space-saving unit. Guide bar easily holds materials firmly in place. For cutting A3 paper. Cartridge-type rotary blade for RX-A3.